A time-series of high-resolution spectra in the optical and ultraviolet has twice been obtained just a few minutes after the detection of a gamma-ray bust explosion in a distant galaxy. The international team of astronomers responsible for these observations derived new conclusive evidence about the nature of the surroundings of these powerful explosions linked to the death of massive stars. 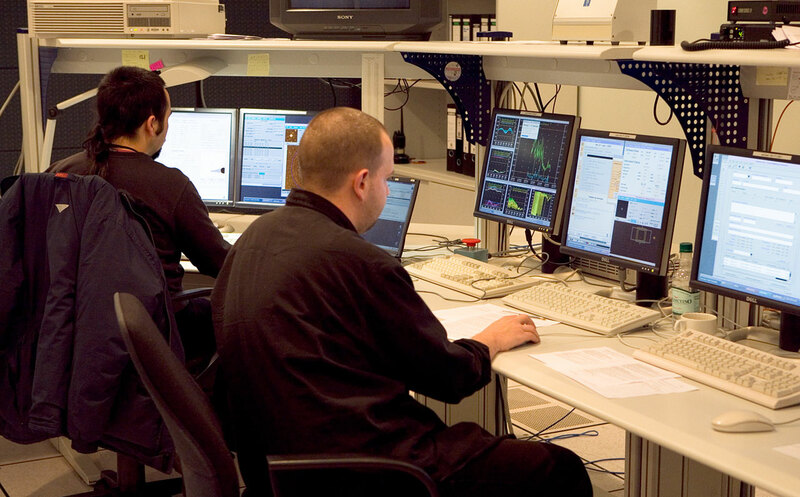 At 11:08 pm on 17 April 2006, an alarm rang in the Control Room of ESO's Very Large Telescope on Paranal, Chile. 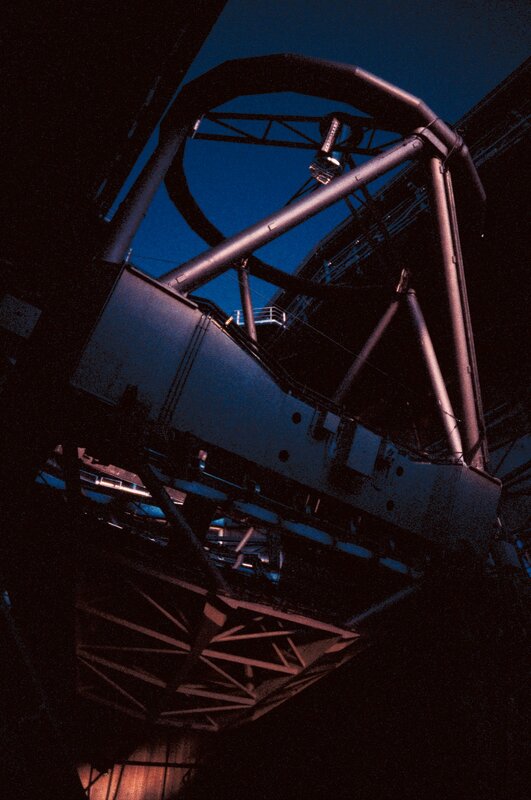 Fortunately, it did not announce any catastrophe on the mountain, nor with one of the world's largest telescopes. Instead, it signalled the doom of a massive star, 9.3 billion light-years away, whose final scream of agony - a powerful burst of gamma rays - had been recorded by the Swift satellite only two minutes earlier. 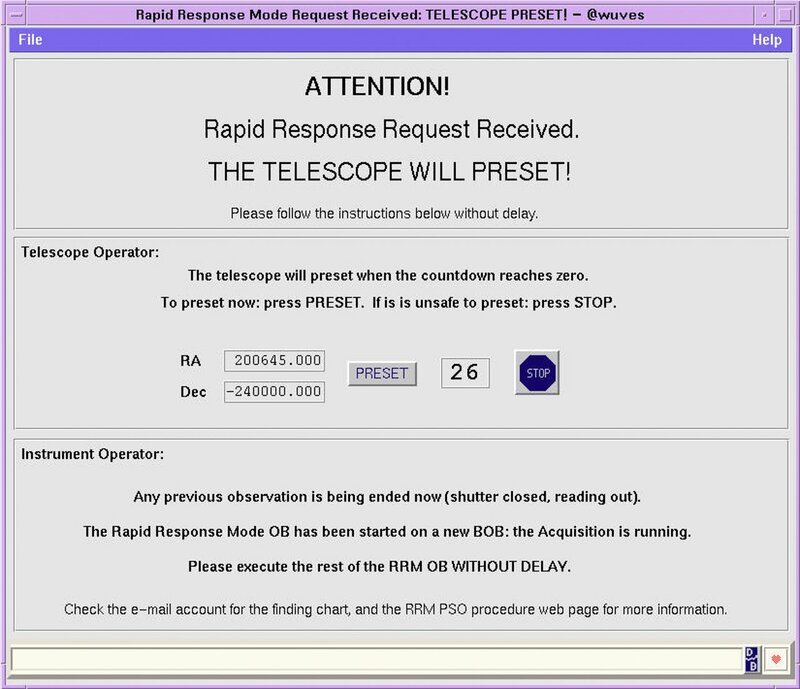 The alarm was triggered by the activation of the VLT Rapid Response Mode, a novel system that allows for robotic observations without any human intervention, except for the alignment of the spectrograph slit. Starting less than 10 minutes after the Swift detection, a series of spectra of increasing integration times (3, 5, 10, 20, 40 and 80 minutes) were taken with the Ultraviolet and Visual Echelle Spectrograph (UVES), mounted on Kueyen, the second Unit Telescope of the VLT. "With the Rapid Response Mode, the VLT is directly controlled by a distant explosion," said ESO astronomer Paul Vreeswijk, who requested the observations and is lead-author of the paper reporting the results. "All I really had to do, once I was informed of the gamma-ray burst detection, was to phone the staff astronomers at the Paranal Observatory, Stefano Bagnulo and Stan Stefl, to check that everything was fine." The first spectrum of this time series was the quickest ever taken of a gamma-ray burst afterglow, let alone with an instrument such as UVES, which is capable of splitting the afterglow light with uttermost precision. What is more, this amazing record was broken less than two months later by the same team. 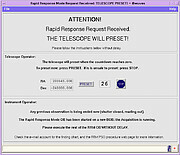 On 7 June 2006, the Rapid-Response Mode triggered UVES observations of the afterglow of an even more distant gamma-ray source a mere 7.5 minutes after its detection by the Swift satellite. Gamma-ray bursts are the most intense explosions in the Universe. They are also very brief. They randomly occur in galaxies in the distant Universe and, after the energetic gamma-ray emission has ceased, they radiate an afterglow flux at longer wavelengths (i.e. lower energies). They are classified as long and short bursts according to their duration and burst energetics, but hybrid bursts have also been discovered. The scientific community agrees that gamma-ray bursts are associated with the formation of black holes, but the exact nature of the bursts remains enigmatic. Because a gamma-ray burst typically occurs at very large distances, its optical afterglow is faint. In addition, it fades very rapidly: in only a few hours the optical afterglow brightness can fade by as much as a factor of 500. This makes detailed spectral analysis possible only for a few hours after the gamma-ray detection, even with large telescopes. During the first minutes and hours after the explosion, there is also the important opportunity to observe time-dependent phenomena related to the influence of the explosion on its surroundings. The technical challenge therefore consists of obtaining high-resolution spectroscopy with 8-10 m class telescopes as quickly as possible. "The afterglow spectra provide a wealth of information about the composition of the interstellar medium of the galaxy in which the star exploded. Some of us even hoped to characterize the gas in the vicinity of the explosion," said team member Cédric Ledoux (ESO). The Rapid Response Mode UVES observations of 17 April 2006 allowed the astronomers to discover variable spectral features associated with a huge gas cloud in the host galaxy of the gamma-ray burst. The cloud was found to be neutral but excited by the radiation from the UV afterglow light. From detailed modelling of these observations, the astronomers were able - for the first time - to not only pinpoint the physical mechanism responsible for the excitation of the atoms, but also determine the distance of the cloud to the GRB. This distance was found to be 5,500 light-years, which is much further out than was previously thought. Either this is a special case, or the common picture that the features seen in optical spectra originate very close to the explosion has to be revised. As a comparison, this distance of 5,500 light-years is more than one fifth of that between the Sun and the centre of our Galaxy. "All the material in this region of space must have been ionised, that is, the atoms have been stripped of most if not all of their electrons," said co-author Alain Smette (ESO). "Were there any life in this region of the Universe, it would most probably have been eradicated." "With the Rapid-Response Mode of the VLT, we are really looking at gamma-ray bursts as quickly as possible," said team member Andreas Jaunsen from the University of Oslo (Norway). "This is crucial if we are to unravel the mysteries of these gigantic explosions and their links with black holes!" The two gamma-ray bursts were discovered with the NASA/ASI/PPARC Swift satellite, which is dedicated to the discovery of these powerful cosmic explosions. The team is composed of Paul Vreeswijk, Cédric Ledoux, Alain Smette, Andreas Kaufer and Palle Møller (ESO), Sara Ellison (University of Victoria, Canada), Andreas Jaunsen (University of Oslo, Norway), Morten Andersen (AIP, Potsdam, Germany), Andrew Fruchter (STScI, Baltimore, USA), Johan Fynbo and Jens Hjorth (Dark Cosmology Centre, Copenhagen, Denmark), Patrick Petitjean (IAP, Paris, France), Sandra Savaglio (MPE, Garching, Germany), and Ralph Wijers (Astronomical Institute, University of Amsterdam, The Netherlands). Paul Vreeswijk was at the time of this study also associated with the Universidad de Chile, Santiago.